2B is one of my faves too! Isn’t it amazing? I hardly ever switch hardnesses, even though I probably should. Never really learned the *right* way to do art, I just do it from my heart. Thanks so much for your comment, and for looking! Fantastic, I think you should frame these cats, they would be purr- fect as a collection of drawings on a wall. You have a damn good talent for these kitties Laura. Awww you’re too sweet sis! ❤️ I agree about drawing…I don’t consider myself a painter at all. I’m a sketch artist and love it! I tried just painting watercolor but I always return to my pens!! (I love the sound of my extra fine point Lamy on paper!!) And I don’t really have any more skills or knowledge… I just tend to be either fearless or dumb or a bit of both, so I kind of just go for it! lol That’s my big secret! And why I didn’t make mine a teaching blog! “Just go for it” is a pretty short lesson so I just put that in my manifesto instead “do the hard stuff before you think you’re ready”! 😊Hehe Hope you have a terrific weekend as well! Lance, your kind words made my morning. Thank you! You know I’m a huge admirer of your work, so it tends to magnify what you say. I wish I could paint like you! Thanks again for your warm encouragement. Awesome Pic! Have a good one! Oh Laura! Another masterpiece for your gallery exhibit!!!!! Awestruck! Such a beauty!! This is your special sweet artista spot Laura! could stare at these forever! Sharon, you will ROCK them both! Can’t wait to see what you do! I got my set of Dr. Martin ink as well – the Bombay ink. We’ll see what happens. I love playing with color. Can’t think of anything more fun than that! Enjoy, my friend! Lovely! Enjoy the long weekend, Laura! Thanks, Catherine! I hope you do too! Nice. Especially those whiskers! Have a great weekend. Thanks, Carmel! I hope you do as well! Thanks, my sweet! Glad you enjoyed! Checking out her site now. As you know, I have a soft spot for kitty pictures and I love your drawing! Thanks so much, Rachel; and I’m so glad that you do! It means a lot! 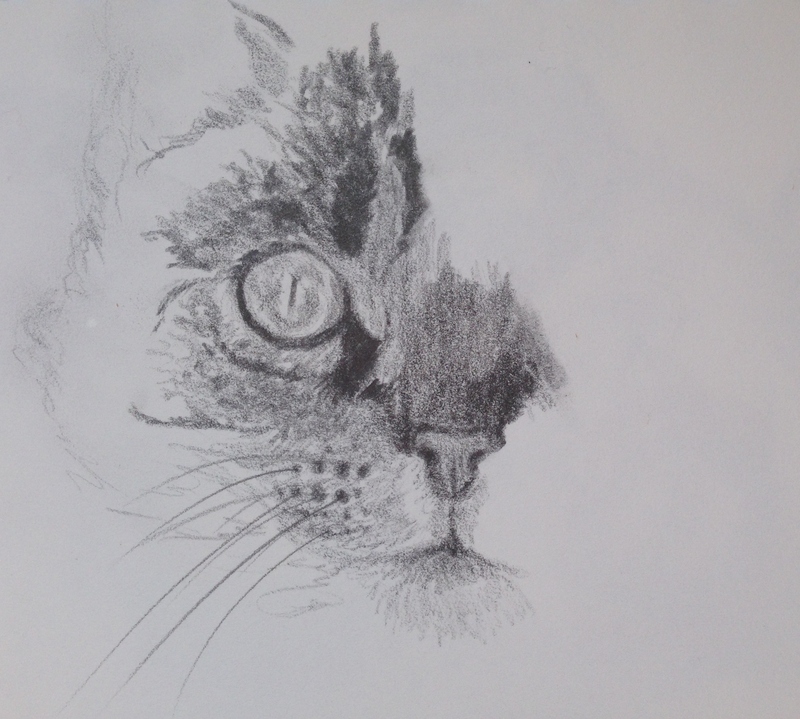 I love this kitty drawing, BEAUTIFUL work Laura! Thanks so much, Deb! You’re so kind! This cropped version is so effective. Thanks, Teri! It’s fun to start these and then something keeps telling me it’s time to stop……hehe. I’d like to finish a few and see, but I do enjoy the partial faces. Glad you do too! The original photo is quite lovely, but your artistic translation is simply gorgeous. Thank you for sharing such a beauty. Enigmatic cat! Thanks for the link to Hearts of Gold! Thanks, Nexi! You’re very welcome! I’m so glad you enjoyed it, Briana! I think her face would have been better if I had finished it, those two big beautiful eyes would have made more of a statement, but I ran out of time. Thanks for sharing your beautiful photos! I love 2B and 4B but gave the latter away as a good deed. I must get a new one. Sweet little face. I love the whiskery bit and nose. Thanks, Suz, glad you enjoyed it. I’m experimenting with some different types of graphite now. So incredible how many different products are out there! Just wonderful Laura I have a thing for cats eyes, they are so captivating. You inspire me to pick up my pencils every time I visit. Oh, yes. Create something every day! Keep up the wonderful work!